In no particular order, here are the 5 best facial makeup primers for oily skin. An award-winning foundation primer this is! I don’t own it though because it is way too expensive. Despite all that raving and awards, it rates only a 3.2 on MakeupAlley. I think it’s a product where you either really love or really hate because the lippies are either 5 or 1. Very extreme. I’ve read of people with oily skin AND people with dry skin both saying that it makes foundation all cakey and flakey, and it can be dry or greasy on different types of skin. Some say it works nothing for them and it’s like putting powder on a mirror. Ha! And then there are those who swear by it and proclaim that this is their HG face primer because it is perfect for covering up lines and large pores. I’ve gone to Sephora on many occasions to do little experiments of this primer on this myself just to understand why people have love-hate relationships with this product. I personally am not a big fan of the Smashbox Photo Finish Foundation Primer, despite it being the go-to face primer for many renowned makeup artists. 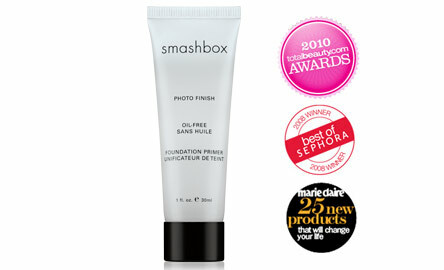 Get the Smashbox Photo Finish Foundation Primer Super Size! I’m totally in love with the Monistat Chafing Relief Powder-Gel. This is MY (and thousands of people who own this) holy grail face primer! It oozes out as a gel, becomes a fine powdery texture upon contact with the skin, and glides on like silk. It’s almost an experience by itself. I did a full review on the Monistat Chafing Relief Powder-Gel and why you’ll love it too! Get the Monistat Relief Powder-Gel! After application it dries to a lightweight, matte finish. This does a fairly good job of mattifying the skin, allowing liquid or powder foundation to glide on smoothly. However, my skin still gets a little shiny in the afternoon (crazily hot weather here all year round!) but it doesn’t feel greasy. A little blotting does the trick. The Mary Kay is not readily available in Singapore though, you’ll need to order it through local Mary Kay agents. Get the Mary Kay Foundation Primer! Ooh, the name sounds really sophisticated doesn’t it? With the HD and the micro and the perfecting. MUFE’s HD microperfecting primer probably started the wave for HD in makeup. They have 6 colors for different purposes – minimize redness, brighten dull skin, combat ashiness, etc. This is a good range for people who have the need for complexion correctors because their Green corrector (to minimize redness) is the top seller. I bought Make Up For Ever – HD microperfecting primer in #5, which is for skin brightening. In truth, I didn’t really see any brightening of my skin. I don’t wear ONLY the primer so anything that goes on top of it – foundation, loose powder, blush, would have buried the effects of brightening of this primer anyway. But as a facial primer, it does a good job of making makeup last. And it smells marvelous too! Get the Make Up For Ever – HD microperfecting primer! The Instant Perfector is a non-greasy makeup face primer and covers appearance of pores. Technically it doesn’t minimize your pores because after you remove your makeup your pores will still be the same size. It however camouflages the pores temporarily so that your makeup can go on smooth and your face stays mattified. Get the Clinique – Pore Minimizer Instant Perfector! So, here are the 5 best face makeup primers for oily skin. What’s your Holy Grail face primer? Any good face primer to add to this list? I am turning 40 and still have acne.. My pores are enlarging and are filling with oil.. I’m wondering if the Monistat will hurt my acne I’m trying to get cleared up? My skin is sensitive also.. Please help!